In the voice memo list, tap the voice memo you want to trim. 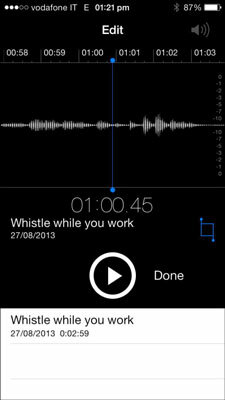 The playback editing screen displays the sound waves of your recording. The blue line indicates the time of the playback and the recording flows behind it. Tap Pause when the playback is just past where you want your recording to begin. Tap the Trim button and you find the blue line where you positioned it in Step 4. The red lines at the left and right sides of the recording are the trim grabbers. Touch and hold the left red grabber and drag it toward the middle to shorten your recording to the point you want it to begin, slightly before the blue line. Refer to the timers to precisely position the grabber. The blue line moves to the right as the recording plays so you can see the exact point at which you want to trim. When the blue line is just past the point you want your recording to end, tap the Pause button. Drag the right grabber to a few seconds after the position of the blue line. When you’re pleased with the position of the trim grabbers, tap the Trim button to save your edited selection (or tap Cancel if you change your mind and you don’t want to trim your voice memo after all). Trim Original: Replaces the original recording with the trimmed recording. 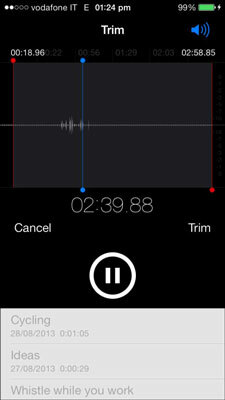 Save As New Recording: Creates a new voice memo without the trimmings — that’s a trimmed recording. This choice is our recommendation — you can always delete the original later but you can’t bring it back after it’s replaced. Cancel: Returns to where you left off working.